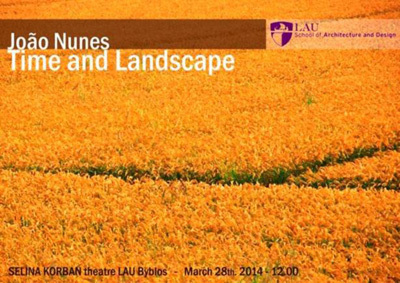 The Department of Architecture and Interior Design is organizing a lecture entitled “Time and Landscape” by João Nunes. Nunes is the founder and CEO of the landscape architecture studio PROAP, which gathers a vast group of professionals in a cross-disciplinary team, with distinguished levels of expertise in landscape. As international director, he is responsible for the strategic and tactic decisions of three international offices: Lisbon (Portugal), Luanda (Angola) and Treviso (Italy). He develops PROAP’s conceptual and creative design, leads project development and defines the strategic orientation of the research processes. He has been lecturing at the Agronomics Institute, Technical University of Lisbon since 1992. He currently also lectures at the Istituto Universitario de Architettura de Venezia, Politecnico de Milano, Politécnico di Torino, Roma La Sapienza, Roma Ludovico Quaroni, and is associate professor in the school of architecture of Alghero, as well as a current full professor at Accademia di Architettura di Mendrisio.